The USMLE Step 3 is the final step to becoming a licensed physician. Students must show they can apply their medical knowledge without supervision. While it is general in nature, it is a two-day exam that still requires dedicated studying and reliable resources. How Can AMBOSS Help You Study for Step 3? Crosslinked content keeps your studying centralized. Every Qbank answer option is linked to a corresponding Learning Card that delves deeper into the topic in question. Learn why what’s right is right, as well as why what’s wrong is wrong. Study from anywhere, anytime, even when you’re offline. Time management is easy with our Qbank and Knowledge apps available for both iOS and Android. Practice going through questions on the wards or during your commute. View your performance progress and get personalized recommendations on what to focus your studying on next. You’ll be able to clearly identify weaknesses and close knowledge gaps. Use real clinical data to get the big picture of any disease or condition. 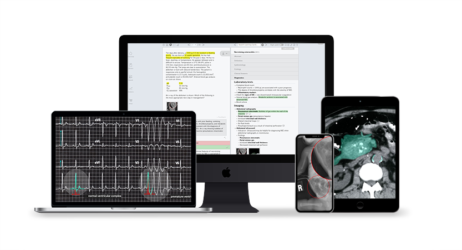 Both the Qbank and Knowledge Library feature charts, X-rays with overlays, videos, SmartZoom samples, and other images that illustrate key points on different topics.